Specialist Meric Greenbaum works at his post on the floor of the New York Stock Exchange, June 24, 2016. Global markets plunged as Britain's vote to leave the European Union sent shock waves across the board. The S&P 500 and the Dow Jones industrial average erased their gains for the year as all three major averages closed near session lows. 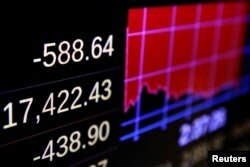 At one point, the Dow was down over 650 points, while the NASDAQ was in correction territory. The CBOE Volatility Index, or the VIX, a measure of volatility in the market, was as high as 47 percent in just one trading session. 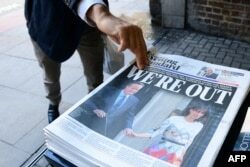 A man takes a copy of the London Evening Standard with the front page reporting the resignation of British Prime Minister David Cameron and the vote to leave the EU in a referendum, June 24, 2016. The “leave” vote puts Britain on track to end its 43-year membership in the EU, and now, political leaders are scrambling to make the next move. The most obvious reaction was an 8 percent move in the pound, plunging to its lowest level since 1985. There were also broad declines in the metals and energy sectors, but the financials were hit hardest, especially the European banks like Deutsche Bank, Credit Suisse, UBS and Barclays. Gold, which is viewed as a safe haven asset, surged more than 5 percent. Investors also sought refuge in the dollar and U.S. Treasury bonds. The only sector in the S&P 500 that was higher in the session was utilities, which are also considered a more safe investment. While the Brexit vote is over, it is not an isolated event. “One thing we have learned with Brexit — it is at least a two-year process. You have the initial reaction, markets will calm down and then we will get news every few months that will bring volatility back into the market,” said J.J. Kinahan, chief strategist of TD Ameritrade. Not all traders are convinced it is time to put money to work. The market now does not expect an interest rate hike until 2018. Fed funds futures are pricing in the first hike to 0.50-0.75 percent as more likely in February 2018, compared with January 2017 at Thursday’s close. The Fed also said it is prepared to provide dollar liquidity through its swap lines with global central banks, as necessary, to address pressures in the global funding markets. A liquidity swap is used by a country’s central bank to provide liquidity of its currency to another’s central bank in times of market stress. “The European Central Bank is for all contingencies,” ECB President Mario Draghi told lawmakers earlier in the week. “We’ve done all the preparations that are necessary. The ECB is in close contact with the banks that I supervise and considers that the euro area banking system is resilient in terms of capital and liquidity." Economic data include: International Trade and Goods, GDP, Personal Income and Outlays, ISM Manufacturing Index and Motor Vehicle Sales. 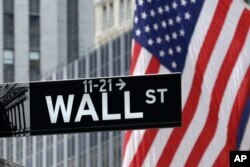 FILE - American flags fly at the New York Stock Exchange on Wall Street, July 6, 2015. GDP will be the most closely watched because it is the all-inclusive measure of economic activity. There are four major categories: personal consumption expenditures, investment, net exports and government. It helps the Federal Reserve and investors gauge the strength or weakness in consumer spending, business and residential investment, and inflation. Unemployment data and GDP are major factors the Fed considers when creating monetary policy. The earnings calendar is still very quiet and will remain light until the season picks up in the second week of July, a welcome change for traders to take the focus off macro concerns. However, there are some reports to be aware of, including Nike, Monsanto, General Mills and Constellation Brands.